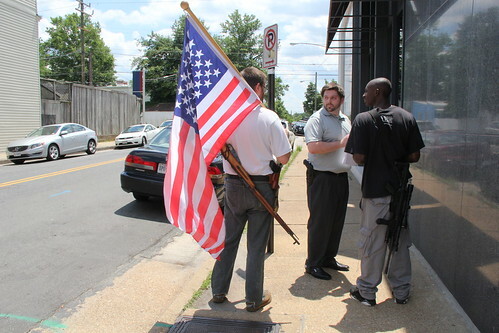 Walking back from Kroger today, I saw a group of five men expressing their right to open carry laws. (Two were moving their cars at the time of the photo). I ran back to my townhouse to grab one of my cameras figuring I'd see them again, and then ran back to Cary Street. I thanked them for being a visual reminder of our freedom. Walking behind them a block before my turn down Belmont, it's kind of sad that many people were eyeing them with suspicion.